Only three weeks into the new year and the holidays are a distant memory. Numerous work projects demand attention, there are tax returns and business leases to attend to, yoga classes to plan and deliver, plus we’re dipping our toes into the world of home-ownership: time is spent traipsing around Brummie streets checking out house facades and ‘The Parking’ (what to do with the car has become a noun in its own right). Any residual emotional energy is sucked up by fear-mongering estate agents. I’ve not been to the allotment for two weeks and am hoping that Grampy’s crysanths have survived last week’s hard frosts – they should be OK, wrapped in their fleecy blankets. When life is busy, it’s hard to think creatively, and yet creative thinking is what’s needed now: next season’s planting needs thinking about and – the best bit – seed catalogues are patiently waiting to be thumbed through. It’s a job for a Sunday afternoon on the sofa, highlighter pen in hand. A bit of baking is a great decompressor. Today it’s cinnamon buns taken from Signe Johansen’s Scandilicious Baking book. 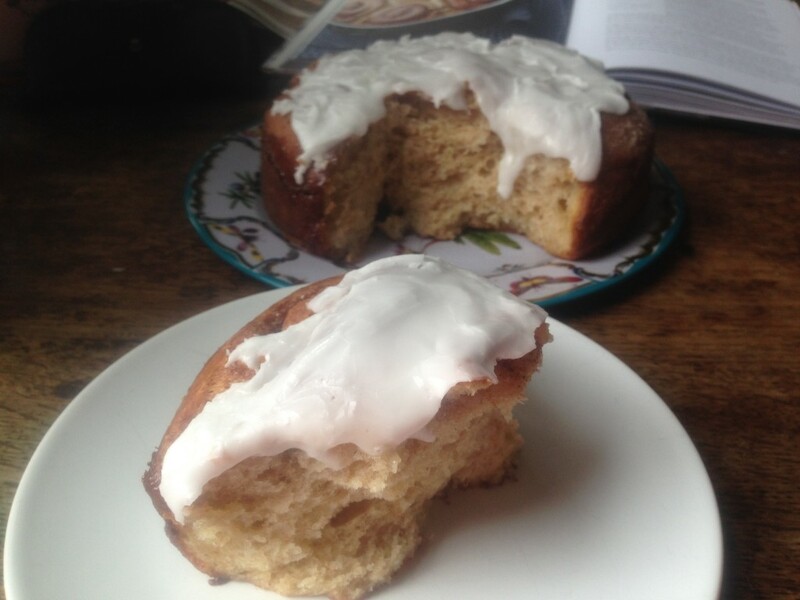 This is a classic Scandi recipe, the buns baked together in a round tin to form a tear-and-share cake. They’re made with plain (rather than strong) flour, which I always find curious in a yeasted dough, but they have the great advantage of being quick to make. Start at 9am and they’ll be on the table by 11.30am, which is super-speedy for a yeasted loaf. Simply mix plain white and wholemeal flour in a bowl with fine salt, yeast, sugar and ground cardamom. A lot of Scandi baking has cardamom at is core, but it can be difficult to find ready ground – mine came from an Iranian shop up the road – so if you can’t find it, just bash up some cardamom pods in a pestle and mortar. (The original recipe asks for spelt flour, but I’m not keen so I sub in a few spoons of wholemeal to get the nutty flavour). Next we need wet ingredients: milk, butter and egg. 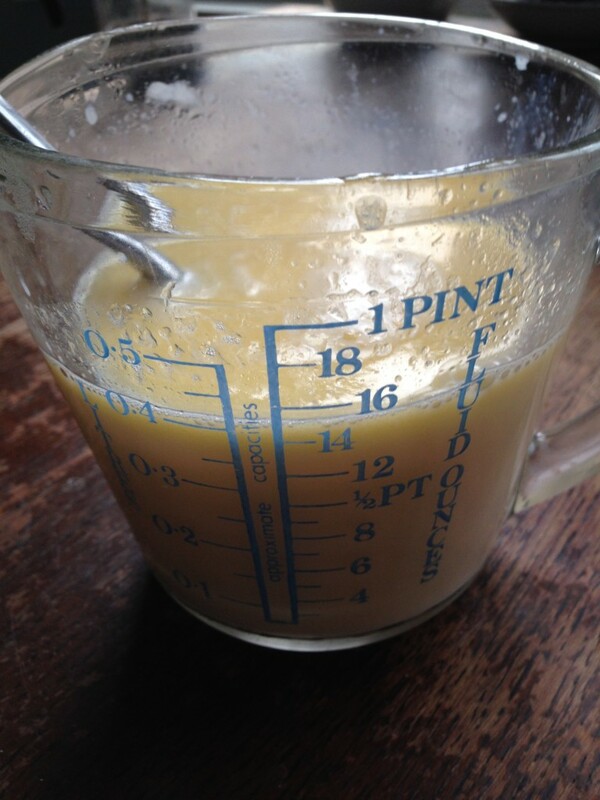 So melt the butter into the milk – I use the microwave for this – then beat in the egg. Apparently, scalding the milk in this way makes for a softer bun. Then just add the wet ingredients to the dry and beat it together. It comes to a loose and wet dough, so I use a wooden spoon for this, but you could use a table-top mixer if you have one. There’s barely any gluten in these plain flours so the mixture doesn’t need kneading, but I do give it a good beat (about 5 minutes) with the spoon. Mix to a soft dough then leave to ferment (rise); no kneading required. 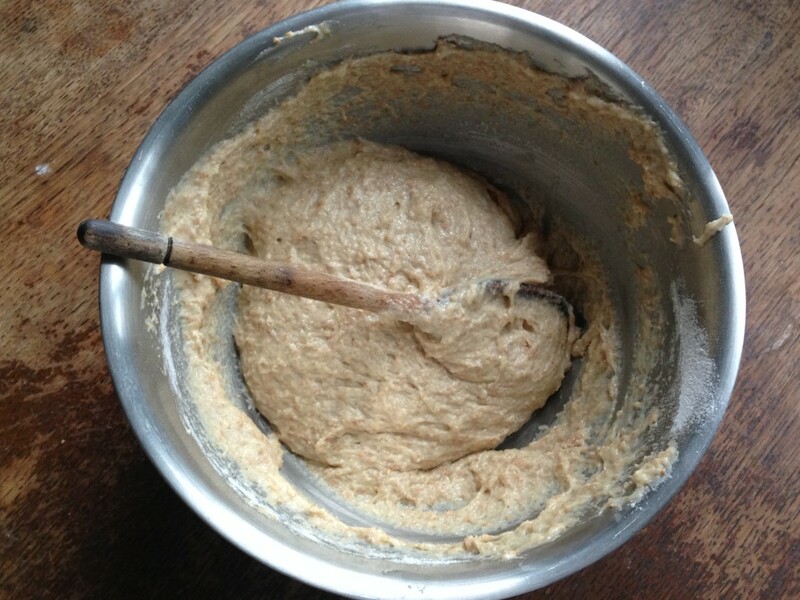 Cover the dough and leave to ferment for half an hour or more – it will grow in size as the yeast gets to work. 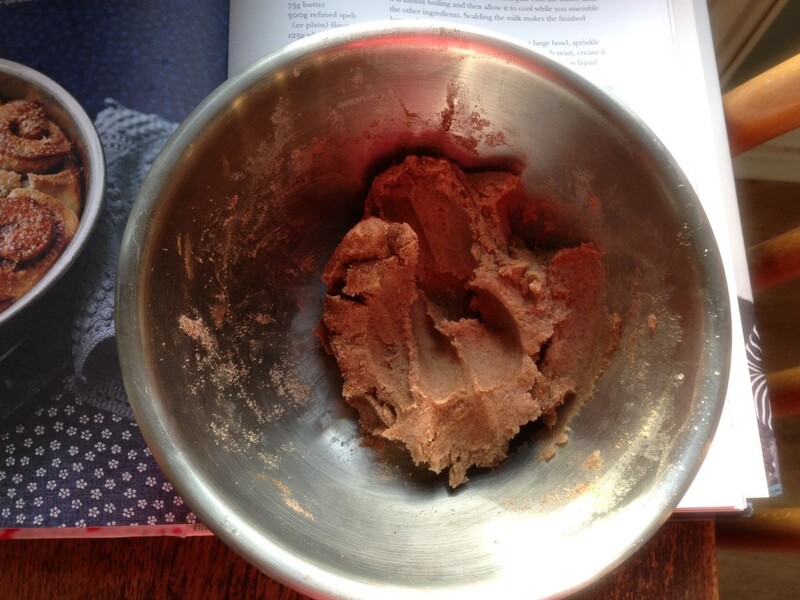 Meanwhile, make the filling by mixing softened butter with caster sugar, ground cinnamon and vanilla. When the dough is ready, pile it out onto a floured work-surface, using a scraper to help you. (I don’t normally like to use much flour as it can change the consistency of your finished bun, but this dough is so soft that it’s a sticking risk.) Use your fingers to gently ease the dough into a rectangle about 25cm x 30cm, then spread the butter on top. I usually soften the butter for a few seconds in the microwave to make this easier. 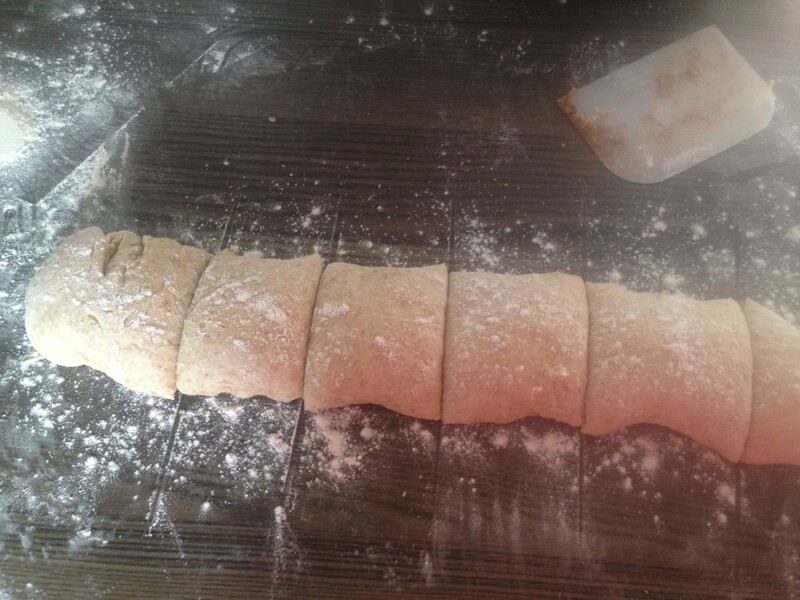 Then roll the dough up from the long end, just like a swiss roll, and slice into 7 pieces. Grease a loose-bottomed 23m round cake tin then place the buns inside, one in the middle and the rest around the edges. Cover and leave to prove for about 30 minutes whilst you preheat the oven. When the buns are puffy and ready – check by poking one with a finger; if the indentation stays put, they are done – then glaze them, if you want, with a little beaten egg and demerara sugar. Alternatively leave them plain but ice them later. Bake at 180c fan for 30 minutes until golden and risen. Leave them to cool and then, if desired, top with a glace icing made by mixing 9 dessertspoons of icing sugar with 2 dessertspoons of boiling water. The hot water helps to remove any lumpy bits of sugar. I love the speed of these buns and they make for a great brunch treat. Truth be told, I prefer buns made the slow way, with strong bread flour and a good knead, but this is a useful recipe to have up one’s sleeve. They’re gently spiced, super-sociable and will keep for a few days in an air-tight tin. 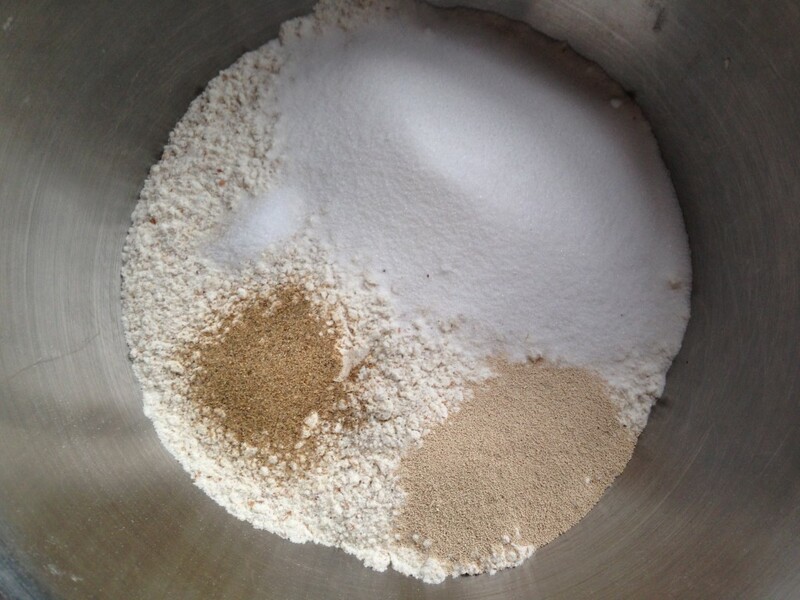 In a large bowl, mix the flours, salt, yeast, sugar and cardamom to combine. 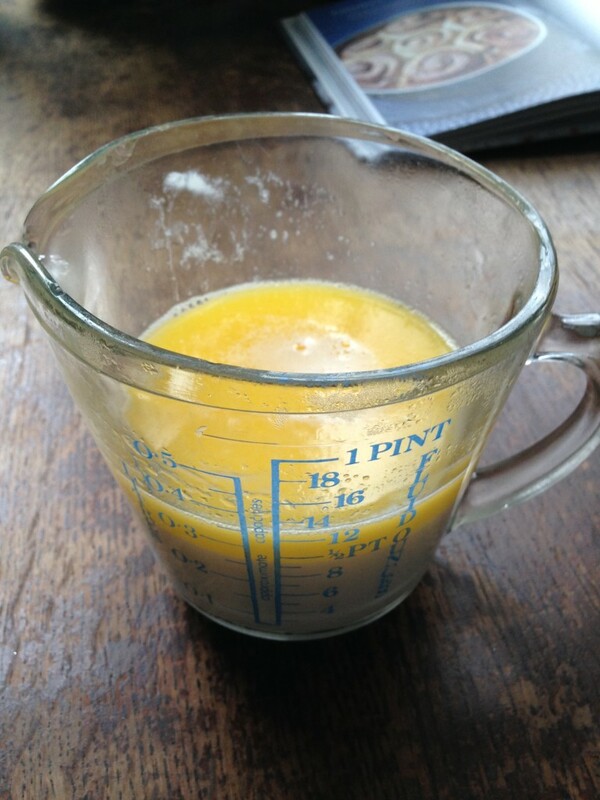 Melt the butter into the milk in the microwave, then add the egg and beat with a fork to combine. 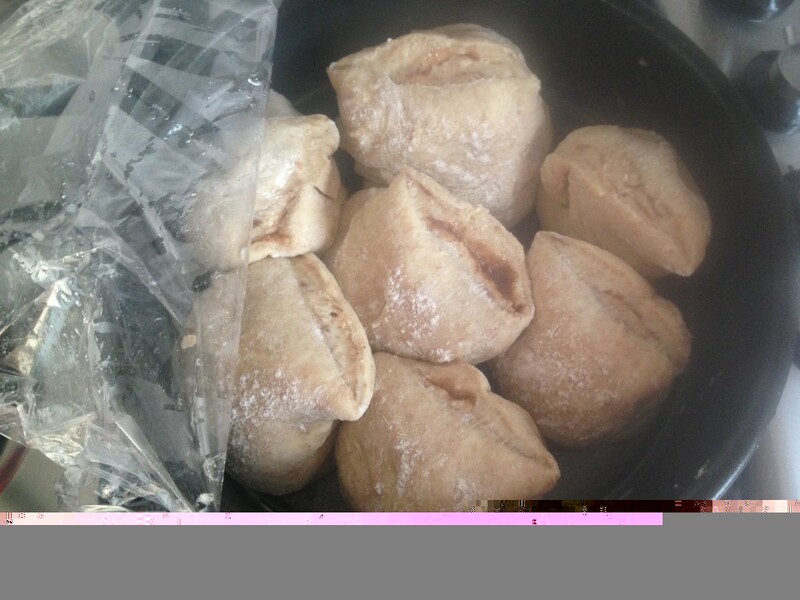 Mix the wet ingredients into the dry and bring together to a loose, soft dough – I use a wooden spoon for this. Beat for a few minutes so that the dough comes away from the sides of the bowl. Cover with a tea towel or clingfilm, then leave to ferment for 30 minutes to an hour. Make the filling by creaming the ingredients together – if the butter is too hard, soften it in the microwave for a seconds, but be careful not to melt it. Grease a 23cm round loose-bottomed cake tin. Flour a work surface then use your scraper to tip out the dough. Use your fingers to flatten it into a rectangle, about 25cm x 35cm. Spread the butter over the dough, then roll up from the long end like a swiss roll. Slice into 7 pieces. Place the pieces into the cake tin, cover again and leave to prove for 30 minutes. Preheat the oven to 180c fan. If glazing your buns, brush them with beaten egg, then sprinkle with demerara sugar. Bake for 30 minutes until risen and golden. Leave to settle in the tin for 15 minutes or so, then remove and cool completely on a wire rack. If icing the buns, mix the sugar and boiling water to make a soft icing, then pour over the bun-cake. Leave to set before serving. 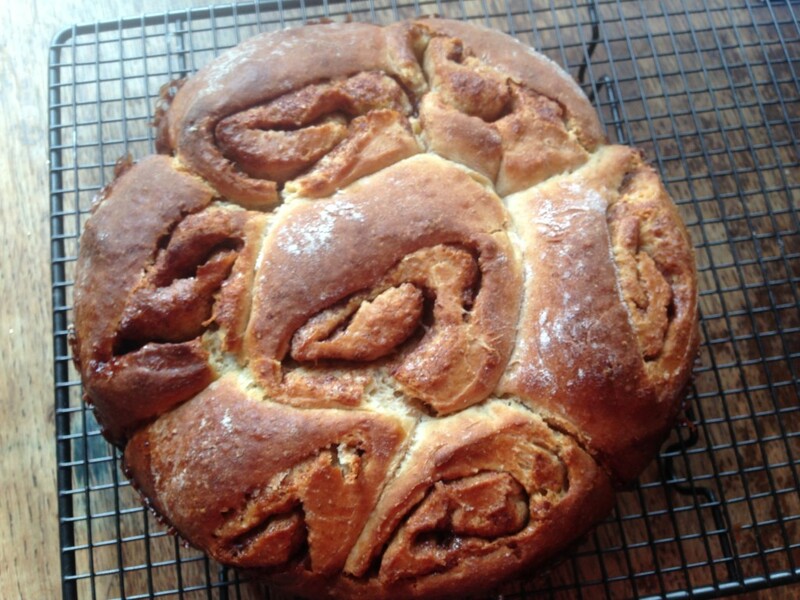 This entry was posted in Recipes, Sweet and tagged baking, cinnamon buns, Norwegian, Scandinavian, Signe Johansen. Bookmark the permalink.